As we start the holiest week of the year, I wanted to share some of the activities we have planned. 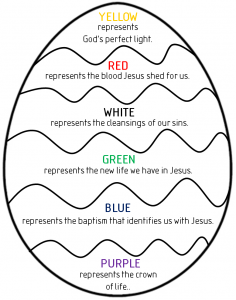 All of them are quick and easy to put together (because that’s kind of where we are at in life right now) so even if you’ve waited until the last minute to try to do something for Holy Week, have no fear. Just click the pictures for links to the directions and activities. 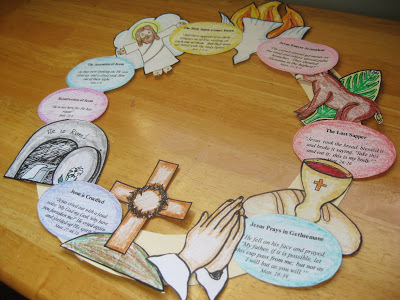 Wee Little Miracles created this beautiful wreath to tell the Easter story. I had seen the same Oriental Trading activity she mentions and wished to do something similar but the author Erin did such a fabulous job, why reinvent the wheel? 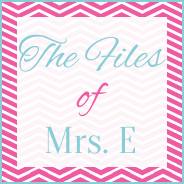 Click the picture to visit her site for all the directions, downloads, and more great ideas. Last year we painted cross paintings that were beautiful and easy to make. We simply made a cross on the paper using painter’s tape and then painted water colors over the cross. We did this with another family. 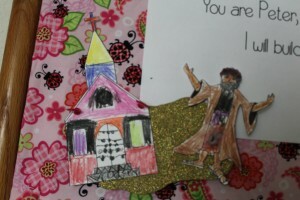 Some of the kids chose to add words with crayons ahead of time; others simply painted around the cross. So of course I can’t find any pictures of our beautiful crosses. I’ll keep looking and update when I find them but in the meantime, imagine a white cross on a page of beautiful watercolors…. 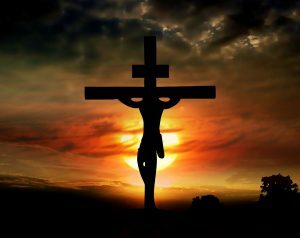 Similar to our cross painting, Do Small Things With Love has done a watercolor crucifix painting. This week the kids get to choose which one they would like to make. 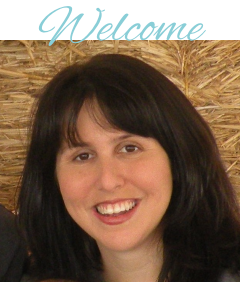 Just click the image to visit her page. 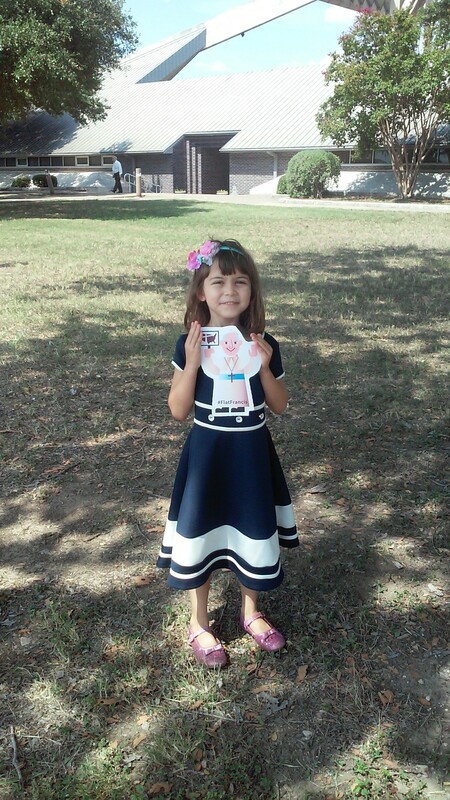 We created this printable a few years ago when our girls were little. Now we have our son who has gotten old enough to make the Easter Eggs so they are back in the rotation again. You can find all the directions here. 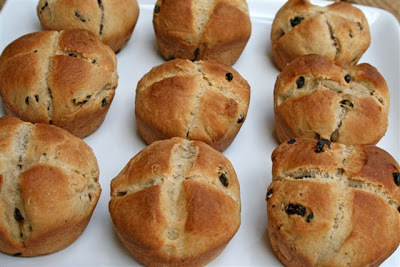 This Good Friday we will be enjoying traditional Hot Cross Buns. On Friday we will simply score the buns with a cross as we will be fasting, but any buns leftover will be getting yummy icing cross for Easter. Catholic Cuisine has a great recipe along with historical info about this Lenten treat. This is one of my favorite parts of our Catholic faith. 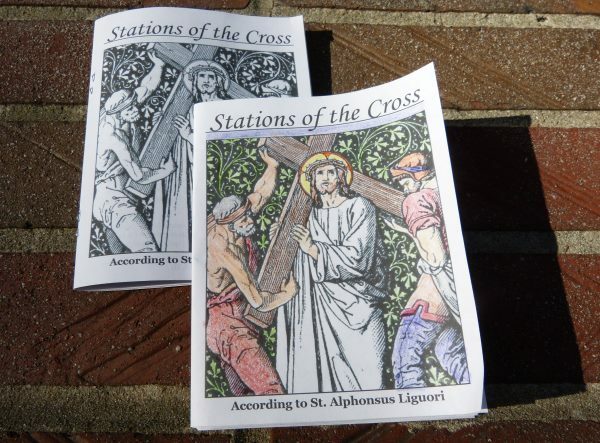 I love the Stations of the Cross. Really, I love Good Friday. Maybe that’s not quite the right emotion or not the right way to say it. But I just love so many people coming together as a group to mediate on the sacrifice of our Lord Jesus, walking in his steps on the road to Calvary, venerating the cross. It does get hard to keep the little ones quiet and focused during the Stations, however. My go-to is coloring books of the Stations so that they can follow along while also staying occupied. Here are a few different ones–just click the image to visit the different sites. 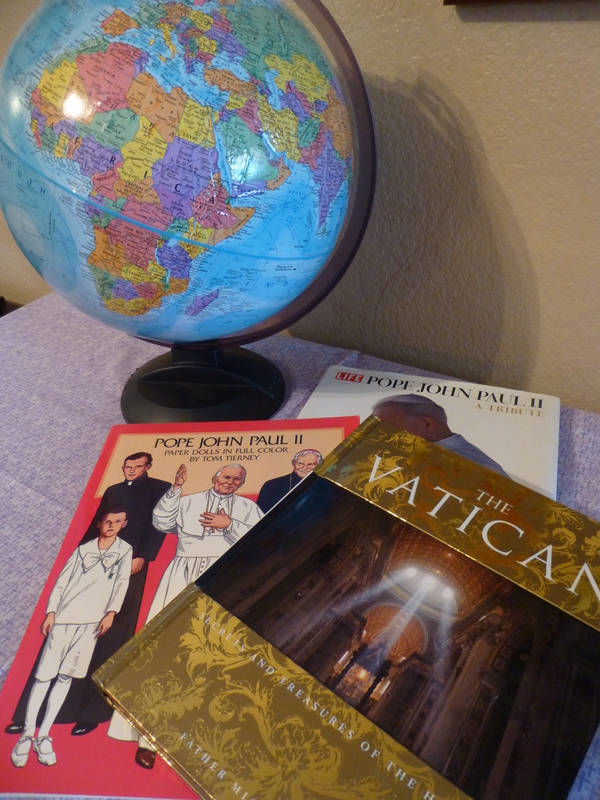 So with Pope Francis’ visit, it’s been all Pope all the time over here at our house. I have been so inspired watching his visit on TV–the joy, the enthusiasm, the challenge to live the life we are called to live. And this has been a wonderful opportunity for our kiddos. This is why we homeschool–to give them an education imbibed with our religious faith. 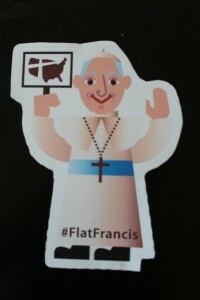 The Pope may be leaving but you can still enjoy some Pope Francis fun. 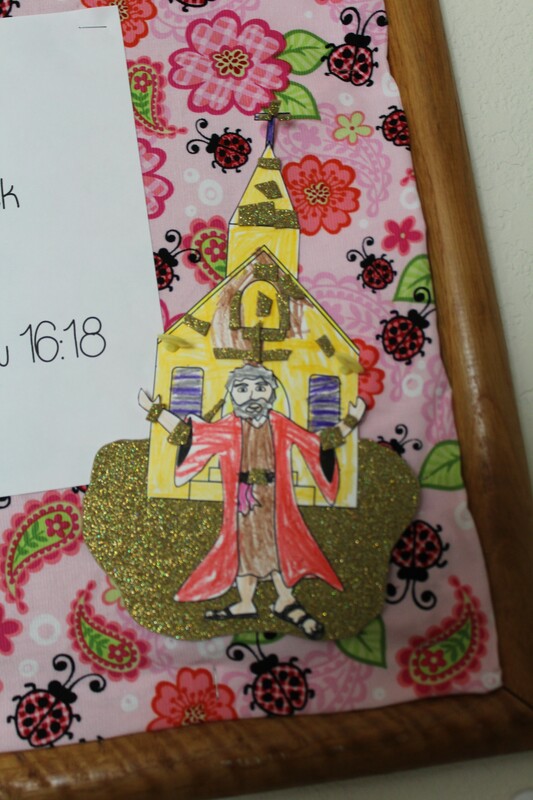 This is the Bible verse the girls have been memorizing this past week (“You are Peter and upon this rock I will build my church”) and this is the craft we did with it. We actually first did this when Pope Benedict stepped down and Pope Francis was elected, but we used a real rock. This time I used glittery fun foam for the rock so that we could attach it to our Bible board. 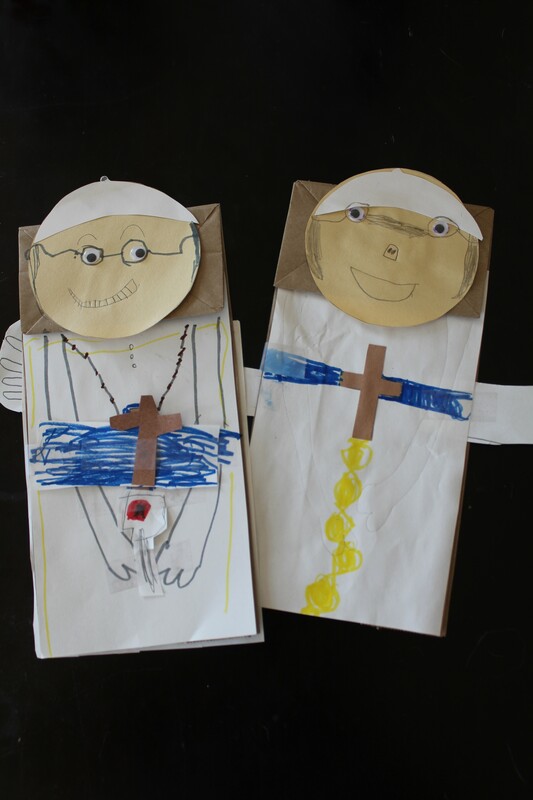 We were inspired by Catholic Icing’s puppet of Pope Francis. I love her saint puppet set! 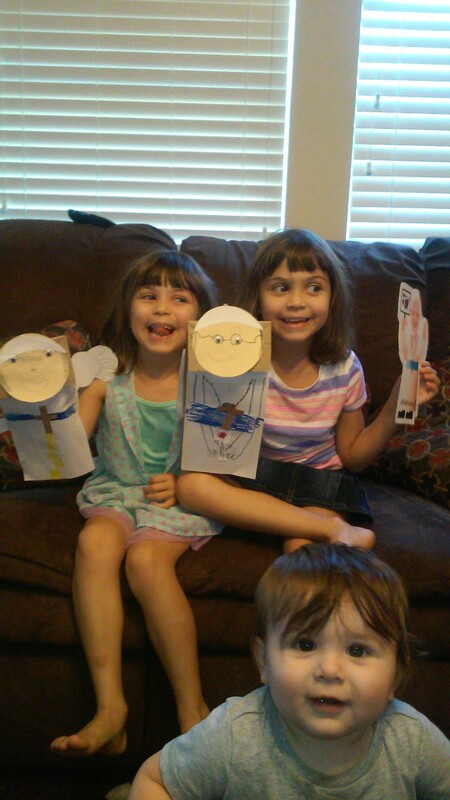 The girls really wanted their puppets to look like our Flat Francis and I think they were adorable. The girls decorated these mitre hats while watching one of the services. Clearly they don’t go for the humble look. 🙂 They are super simple to make. 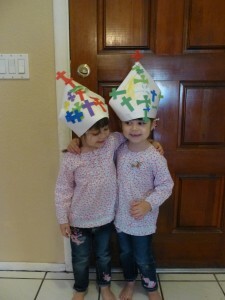 Just cut out the mitre shape from white paper and then add a band so you can wear them. But they loved wearing them! 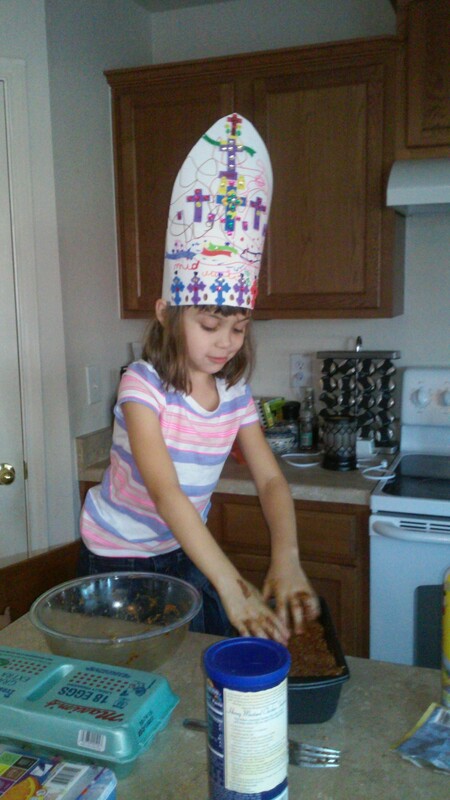 This is one of my favorite pictures–Mia helping make dinner while wearing her hat. 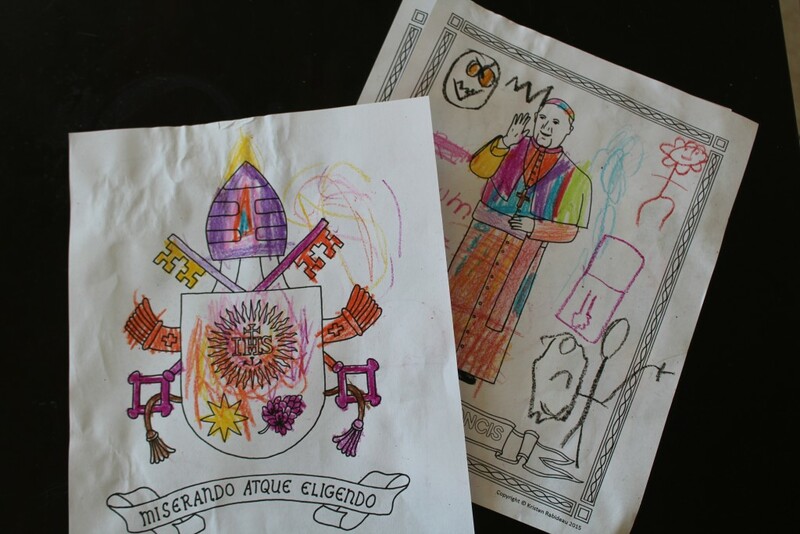 We also enjoyed pope coloring sheets from Drawn 2 Be Creative which you can find here. She has Pope Francis and the Vatican crest. Like many of you we have the Little People Nativity set by Fisher Price. 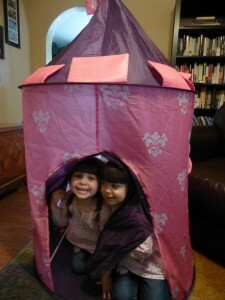 My girls LOVE it! Last year after playing with it all through Advent and the Christmas season, it was time to pack it up with all of our other decorations. As we cleaned I would put it in the storage box and my girls would pull Baby Jesus out and put him back with their other Little People. They complained that they wanted to keep playing with him and after a few times I realized just what I really was doing. 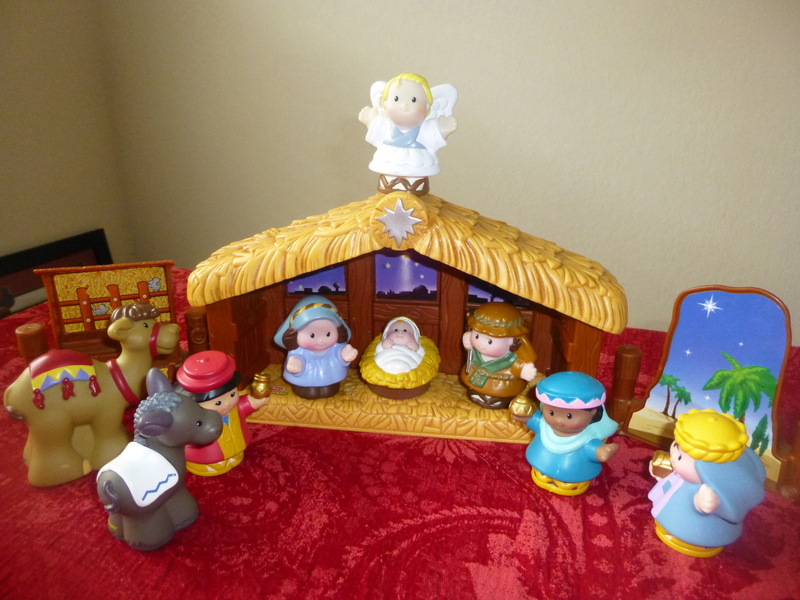 As the holiday season comes to a close for some of you and you are putting away decorations, consider the lesson I learned that day–don’t put away Baby Jesus. Many think of Christmas as one day but really the Christmas season extends until January 6, the Feast of the Epiphany, when the wisemen came. You know the song “The 12 Days of Christmas”? These are the 12 days. Some cultures even wait until then to exchange presents. I have some friends who won’t even let their children play with their Little People Nativity because Jesus is one to be revered not tossed around. And while I can understand what they are saying I disagree. This past year as I watched Baby Jesus be pulled around in a tractor and attend princess parties I couldn’t help but think that this is exactly what I want for my daughters–for them to have a personal relationship with Jesus Christ. I want my girls to feel him throughout their day-to-day lives, not just on Sunday. Now I know my children need a great deal more in their spiritual upbringing and this is just a toy, but those toys are a great reminder for us adults to make sure we continue to make Jesus a focus in our lives as we get back into the “normal” swing of things. 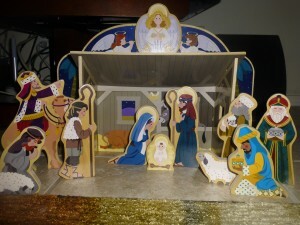 So when packing up your children’s nativity set this year, consider leaving it out for a little while longer. 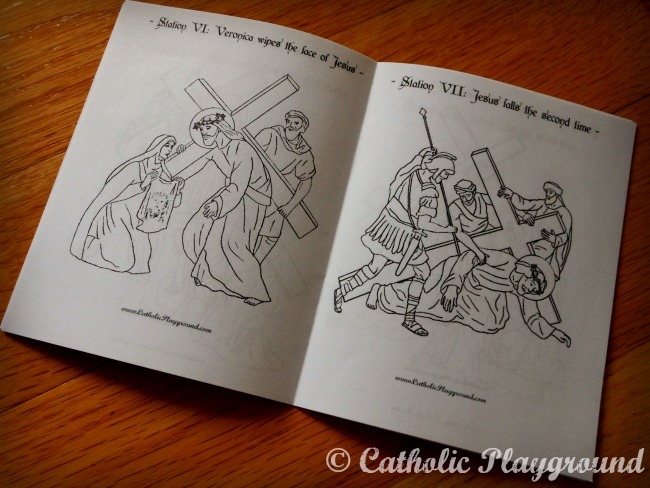 Let your kids continue to play with the Holy Family with the rest of their play things. 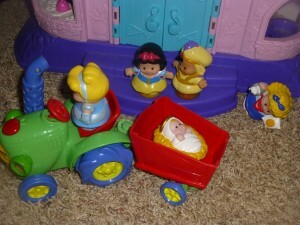 I hear Jesus can be a great influence on the other toys. 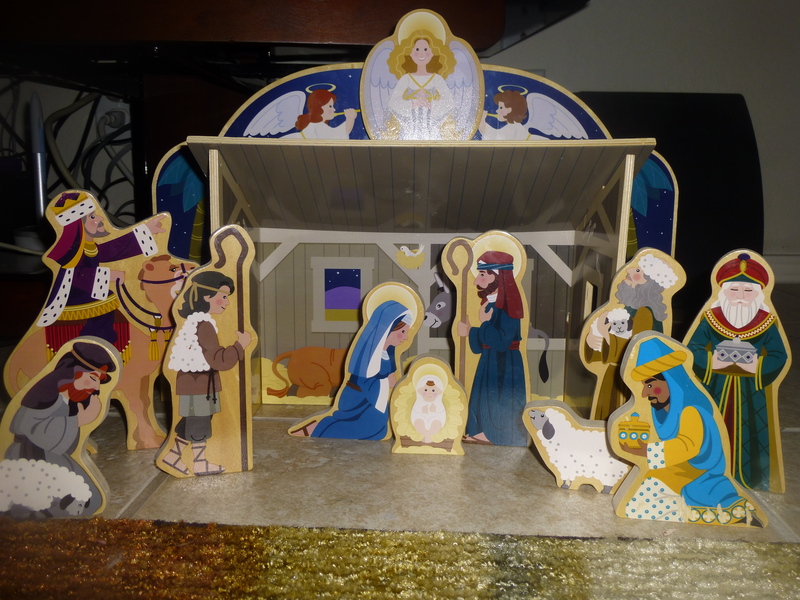 This is why it’s a good idea to have a children’s nativity…. Here are my girls playing with our “fancy” nativity. P.S. 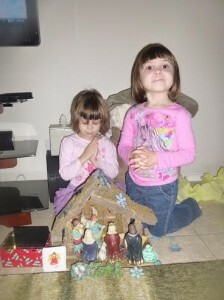 If you don’t have a children’s nativity, consider getting one in time for next year. 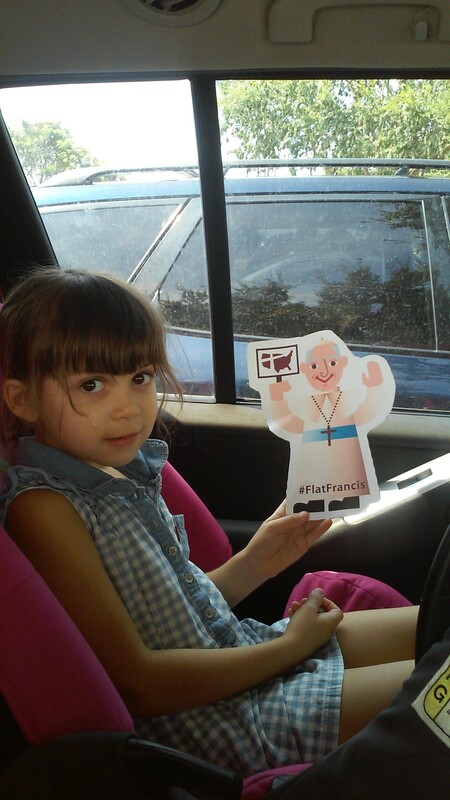 Today is Pope Benedict’s last day and since we have been following the news coverage and will continue to do so throughout the conclave, it seemed like a very good time to talk more with the girls about the pope and our Catholic faith. I wanted to share our activities with our Catholic friends since there will continue to be quite a bit of pope talk over the next few weeks. Our Peter craft worked perfect with this. While the girls were coloring Peter and the church, we talked about Peter being a friend of Jesus and that after Jesus went to heaven Peter led our church with the help of friends. This is why Peter was the first pope. You can find the directions and template for the craft here. 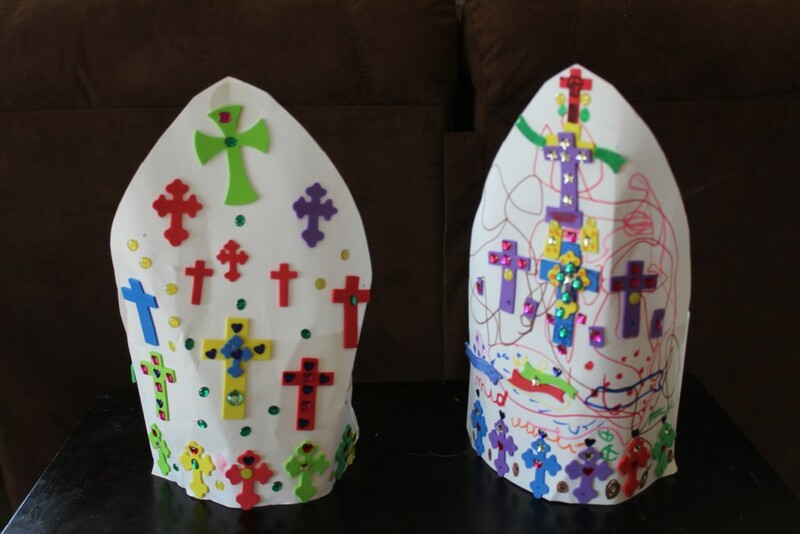 I used the directions from Catholic Missionary Family found here to fold our own “pope hats.” After making them out of white paper, the girls decorated them with crayons and fun foam crosses. They were very excited when we saw a picture of the Pope and cardinals all wearing them. His Holiness, Pope Benedict XVI PP. To talk about how they will choose the next pope, I was going to make a cave with blankets for us to sit in together. I know that they don’t meet in a cave, despite the way conclave sounds. (The word actually means “with a key” and refers to the cardinals being locked in until they voted in a pope.) We were a little tired though so just put up our castle tent and we called it a cave. When the girls saw pictures of St. Peters Basilica they decide that’s where we were. We talked about how the cardinals do special voting to pick the pope (to remind us what voting is we did a few practice votes about things we like) and then how the cardinals are unable to leave the Vatican until they have picked someone, which we will know by the color of the smoke. We did this craft when learning about St. Peter, the Bible verse Matthew 16:18, and the founding of our church. And so I say to you, you are Peter and upon this rock I will build my church, and the gates of the netherworld shall not prevail against it. For ours we used the smaller version of the church. 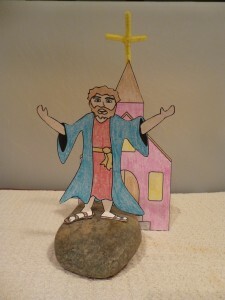 After coloring and cutting them, we attached Peter and the church to the rock with a hot glue gun and then added the pipe cleaner cross to the church. To make Peter stand up, we folded his feet out a bit. This Bible verse and craft went well with our rock unit we have been doing. We’ve also been talking about who the Pope is, especially with Benedict XVI resigning.